The Mitten is a little place focused on Michigan crafted Beer, Wine & Spirits. Located in Downtown Ludington, the Mitten Bar a destination and culture that celebrates craft beer as well as artisan wine and fine spirits from all around Michigan. And it doesn't stop there...You'll also find live music and special events each week. 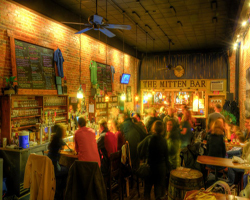 Come celebrate the great Mitten state and all it has to offer at the Mitten Bar! Note: Some map locations are approximate. Please call the venue at 231.843.7616 for exact directions.